We know that the whole creation has been groaning in labor pains until now; and not only the creation, but we ourselves, who have the first fruits of the Spirit, groan inwardly while we wait for adoption, the redemption of our bodies (8:22-23). With Easter, Christians celebrate Christ’s triumph over death. The Son has been murdered, and the Father has responded by giving him new life. And specifically within that, his broken body has been resurrected and glorified (with scars still remaining), which signals a promise to us about the irrevocable goodness and ultimate glorification of our own bodies (also scarred, perhaps), and of creation as a whole. The groaning of our bodies reaches out toward an eschatological promise. And the Easter implication of all this is that Christians are called to come together, as Christ’s corporate body, witnessing to him and living as a sacrament of divine love for each other and for the world. It is an embodiment that is social, tactile, joyful. Speaking about how we understand all this today, I know many Christians who, in preparation for this occasion, have been partaking of Lenten acts of purification and ascetic seriousness in order to refocus their attention, their bodies, on God and the celebration of the Triduum. Given that Easter is saturated with various overlapping meanings, I always have difficulty speaking well about it (and this problem has only been compounded by the PhD in theology!). So I’m going to explore its significance and what it calls us to indirectly, by describing something else, and then perhaps we’ll get there. Many of us theology types in Boston are aware that renowned Anglican theologian, poet, and former Archbishop of Canterbury Rowan Williams was recently doing a little touring and speaking in the area. He gave a talk at Boston College about inter-religious dialogue (“Revelation in the Context of Interfaith Dialogue”), and, shortly before that, he gave a talk at the Carmelite monastery of Boston about Teresa of Ávila and spirituality within the context of the Christian community (“Teresa of Ávila on Spirituality and Community”). He also made himself available in various ways to Boston College’s theology department. I attended and enjoyed both of the public talks, but for here I am going to focus on the talk he gave at the Carmelite monastery since I don’t think many people in the theological academy were there (but there were Carmelite nuns aplenty!). I keep thinking about this talk because, in it, Williams deploys Teresa’s writing in service of making particular claims regarding the point of Christian spirituality, which, for Williams, is the following, I believe: to be open to God and to be friends with God, in order to be friends with each other. I think this strikes to the heart of what Easter demands of us: joy with God and with others, in gratitude for God’s ultimate overture to us in the Incarnation. But, as Williams argues and as Teresa herself argues, this is not the point of spirituality, and it’s beside the whole point of Easter. I will say, as a brief aside, that when I taught her most mature work, The Interior Castle, in the “Exploring Catholicism” class this semester, I think many of my students were initially scandalized by the sexual overtones of Teresa’s spiritual chronicling (and then a lot of them, especially the women, really seemed to get on board with it, go figure). I think this is a fruitful sort of discomfort for them to have, though that’s a post for another day. My main point right now is to highlight what I take to be Williams’s main concern in his talk: the way that Teresa’s rather singular or unusual experience of the Christian spiritual life can in many ways be misleading or interpreted poorly. Here’s how: when we look at Teresa’s life, there is a danger of reveling in the ostensible exoticism of her connection to God (as she herself describes it), and in thinking that the point of striving for holiness, seeking to be open to divine grace, is to have a certain kind of comforting or exciting, private experience where one feels (perhaps implicitly sanctimoniously) “set apart” for God, over and against others. This is certainly not how Teresa herself understood the purpose of her own life. 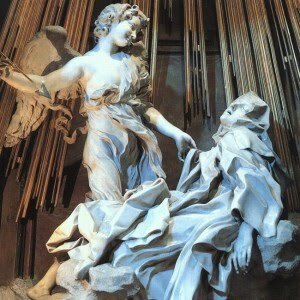 Because the other important thing about Teresa is that, as a reformer of the Carmelite order at the time, she was busy founding the Discalced Carmelites and establishing multiple convents for her sisters. She needed to articulate a bold vision for how they were to relate to each other in and through their communal living, on a daily basis, through thick and thin, day in and day out, washing dishes and cleaning clothes and trying to respect each other throughout it all. I want to tell you again here lest someone think that the reason is solely for the sake of giving delight to these souls; that thought would be a serious error. His Majesty couldn’t grant us a greater favor than to give us a life that would be an imitation of the life His beloved Son lived. Thus I hold for certain that these favors are meant to fortify our weakness…that we may be able to imitate Him…This is the reason for prayer, my daughters, the purpose of this spiritual marriage: the birth always of good works, good works…This is what I want us to strive for, my Sisters; and let us desire and be occupied in prayer not for the sake of our enjoyment but so as to have the strength to serve…The Lord doesn’t look so much at the greatness of our works as at the love with which they are done (“The Seventh Dwelling Places” #4; #6; #12; #15). For Teresa, there are some who have, for whatever reason, been marked out for mysticism by God, and these people may indeed have some kind of unusual, overwhelming, strange experiences of prayer, but the point of all that jazz is to be able to have one’s feet on the ground and to attend to the needs of the other in one’s midst. And attending to the needs of the other doesn’t even have to be particularly grandiose; it can be as simple as engaging them in conversation even if you don’t feel like it. It can be anything, really, because the point here is to avoid trying to be an admired Christian “hero” whose virtue is ostentatiously and dramatically on display and, instead, to do what needs to be done. Because if you pray all the time but can’t do something as simple as give a fellow human being the time of day, your prayer life is dead. In other words, for Teresa and for Williams’s interpretation of Teresa, as far as spirituality is concerned, when things seem to be at their strangest, most occult, most esoteric, and most private, their authenticity and value is demonstrated if those very things turn out to be the most ordinary, most out in the open, most quotidian, and most social. Spiritual intimacy with God occurs in and through living one’s life in genuine concern for the welfare of others, with joy and patience. According to Williams, we learn from Teresa that “what makes a person spiritual is the extent to which they give what is needed in the shared life.” And this is what Easter is about, what Easter calls us to: grateful love for God, grateful friendship with others. 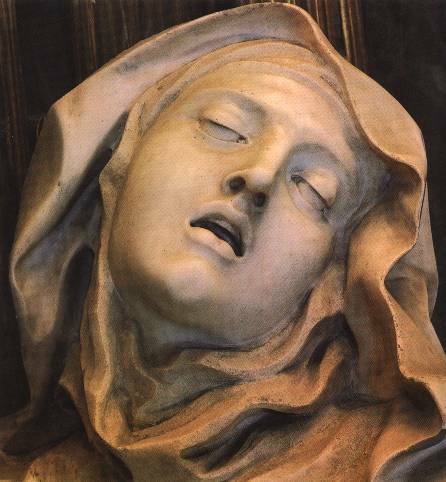 So again, in the end, as Williams goes on to point out in his talk, Bernini’s statue of Teresa’s mystical ecstasy actually tells us very little about the heart of the spiritual life and, I would add, God’ invitation to us in Easter. When the Son of Man comes in his glory, and all the angels with him, then he will sit on the throne of his glory. All the nations will be gathered before him, and he will separate people one from another as a shepherd separates sheep from the goats, and he will put the sheep at this right hand and the goats at the left. Then the king will say to those at his right hand, ‘Come, you that are blessed by my Father, inherit the kingdom prepared for you from the foundation of the world; for I was hungry and you gave me food, I was thirsty and you gave me something to drink, I was a stranger and you welcomed me, I was naked and you gave me clothing, I was sick and you took care of me, I was in prison and you visited me.’ Then the righteous will answer him, ‘Lord, when was it that we saw you hungry and gave you food, or thirsty and gave you something to drink? And when was it that we saw you a stranger and welcomed you, or naked and gave you clothing? And when was it that we saw you sick or in prison and visited you?’ And the king will answer them, ‘Truly I tell you, just as you did it to one of the least of these who are members of my family, you did it to me’ (vv. 31-40). We know that the goats at his left hand do not fare quite as well. So do we who are seeking after a truly Christian spirituality, who have been engaged in acts of Lenten asceticism and refocusing of our bodily habits and desires, sufficiently connect our prayers and our worship with an attention to others, especially those are vulnerable in various ways (economically, socially, ethnically, emotionally, etc.)? When we celebrate the Triduum, the passion, death, and resurrection of Jesus Christ, do we then attend to the others around us, in the world, with greater sensitivity, joy, and patience? Do we care for their bodies, groaning and waiting for redemption? Are we receiving this Easter invitation with open hearts? Marvelous and fair integration of really complex realities, thank you. This is a fine synthesis and explanation of Carmelite and Christian spirituality, so thank you from a Discalced Carmelite Secular. Thank you for an interesting and inspiring post, for sharing the talk you heard. I hope you had a lovely Easter. Hopefully I’m not leaving a duplicate comment – it all went a bit weird when WP asked me to sign in. I simply wanted to thank you for a post that shared an insight that really resonated with me and to hope you had a lovely Easter.